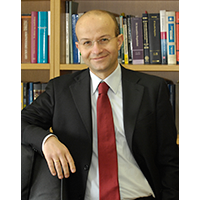 Panagiotis is Associate Professor of Banking and Finance Law at the Department of Banking and Financial Management, School of Finance and Statistics, University of Piraeus in Greece. Since 1st December 2017, Panagiotis has been holding the post of Chair at the Department of Banking and Financial Management. Panagiotis also holds the position of Adjunct Professor at the Hellenic Open University. Panagiotis is a qualified Mediator (Directive 2008/52/EC) in civil and commercial matters and he is a listed in the Register of Qualified Mediators of the Athens Chamber of Commerce and Industry. Since 2017, Panagiotis participates in the Scientific Council of the EODID Athens Mediation & Arbitration Organization – an institution established by Nomiki Bibliothiki (http://www.eodid.org/en/). He has also served as member of the Hellenic Capital Market Commission Working Group on the codification of the capital markets law (2013) and as member of the Law Commissions for the transposition of EU Directives 2003/6/EC (Market Abuse Directive) and 2004/109/EC (Transparency Directive) in the Greek legal order. Since 2007, Panagiotis has been liaising with Greek credit institution and delivers training courses as part of the professional qualification programme offered to bank executives who participate in the professional accreditation exams concerning the provision of investment services. Panagiotis is also a Supreme Court attorney-at-law registered with the Athens Bar Association and is running as managing partner a law firm with expertise in financial services, commercial and company law. For more than 15 years he has been advising, as legal counsel and expert, corporate clients and individuals on a wide range of issues involving the application and interpretation of financial services law. Panagiotis holds an LLB degree from the Law School of the University of Athens, an LLM degree in Banking and Finance Law from Queen Mary University of London (QMUL) and a PhD degree in securities regulation from London School of Economics and Political Science (LSE).